The Latitudinal Gradient Project (LGP) is a framework under which several different research projects from New Zealand, Italy and the United States are operating. A total of 18 projects under the LGP are studying terrestrial, marine, and freshwater ecosystems along the Victoria Land coast in the Ross Sea region of Antarctica. 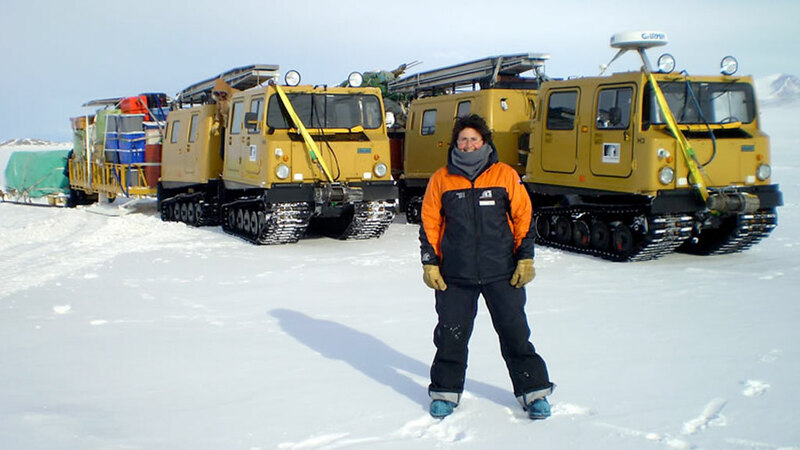 Shulamit Gordon, the project manager for the New Zealand LGP, spent a few moments to speak to SciencePoles about the LGP. Why use latitudinal gradients as a proxy for climate change? The seasonal variability of solar radiation is at its most extreme at high latitudes (between 60-90°). As you head south in the Southern Hemisphere, the average annual amount of solar radiation decreases. Following from this, there is evidence that there is a gradient of temperature and ecosystem response, although this is certainly a complex gradient. But in general, the assumption is that the further south you go, the lower the average annual temperature. So the idea was to pick representative sites along a latitudinal gradient - in this case the Victoria Land coast - study them, try to describe them, and then say "if we have warming, maybe sites further south will start looking like sites further north - maybe in a particular location there will be a change in flora and fauna on land or in the water as the climate warms." Is the LGP the first time ecosystems large or small have ever been measured along a latitudinal gradient? To my knowledge there has never been a coordinated effort to look at ecosystems along a specific gradient in Antarctica involving several disciplines working in conjunction with each other. Within the New Zealand Antarctic programme, there was one team of soil scientists, Iain Campbell and Graeme Claridge, who worked for New Zealand's Department of Scientific and Industrial Research Soil Bureau several decades ago. Between 1959 and 1970 they conducted their own sort of mini-LGP along the Victoria Land coast, describing soils and soil processes at sites from Cape Hallett in the north to the Shackleton Glacier in the south - an incredible coverage. The information they collected has become invaluable to our current LGP. Could you give us an idea of the kinds of research programmes involved? There are a diverse number of projects within the New Zealand programme. We've got marine scientists studying ecology, one group looking at micro plankton and small larvae in the water column and one group looking at algae in the sea ice. As for terrestrial research, we've had people studying the water chemistry of the terrestrial ponds as well as moss and lichen, invertebrates, soil fauna and soil chemistry. And now we've got a group interested in geomorphology, which links in nicely with research studying the fauna in certain areas along the coast, because of a number of refugia sites (areas where special environmental circumstances have allowed species or communities of species to survive after extinction in surrounding areas) that have been discovered. The geomorphologists are able to date the surface landforms, thus backing up some of the conclusions about the fauna being around for a long time. How have you been managing data coming in from all these different sites along the coast? We're trying to organise all the data so that every scientist working in Victoria Land can see what kind of data have been collected. This is particularly useful in comparison studies between different sites. It's also important to mention that while you want to try to get as much detailed data as possible from a given site, there's also a lot of work being done between the five main sites outlined in the project framework; we take any data relevant to the LGP into account as well. This includes the Americans' Long-Term Ecological Research (LTER) Project, which has a main site in the McMurdo Dry Valleys and serves as a good central reference site for the Victoria Land coast. They've amassed about 15 years of data, which is very valuable. How are all the programmes contributing to answering the eight key questions outlined in the LGP project description? Everybody is answering one or more questions, and between all the research programmes all eight questions are being covered. In fact, we published a special LGP edition of the journal Antarctic Science in 2006, which had 18 contributions, all answering one or more of the eight questions. Now I'm in the process of pulling together a second LGP special edition of Antarctic Science for publication in 2010. This time about 28 scientists have shown an interest in contributing, including British teams doing research on the Antarctic Peninsula. This really shows the success of the project and how we have linked with other researchers in other parts of Antarctica and other disciplines. You're about halfway through the LGP. What have you been able to accomplish so far? So far we've had three years of research at Cape Hallett, two years at Terra Nova Bay, we've just had our first year in Granite Harbour, and we've just completed our second year at the Darwin Glacier, so we're over halfway through all the sites we plan to visit during the project. We have another proposed site to visit around New Harbour, which is in the annual ice zone, and then another site further south at the Beardmore Glacier, or possibly further south than that. One thing the scientists asked us to do was visit the most northerly site at Cape Hallett and then the most southerly site at the Beardmore Glacier so they can start with the two extremes and then fill in the gaps in between, but in reality it's been easier said than done. We've actually been going from north to south a bit and then dropping further south, although we haven't done any work at the Beardmore Glacier yet. It's 800 km south of Scott Base, so it's really going to take some work to get down there. We hope to do this in a collaborative effort with the US, which has a few groups that would like to study that area - hopefully within the next five years. Have you made any significant discoveries? The scientists working within the framework of the project haven't been able to make a full comparison yet, and they won't be able to until we get closer to the end of the project and have visited all the sites identified. In saying that, each project is certainly building a picture of the differences or similarities between sites that have been visited so far. Prof. Allan Green from the University of Waikato, who's working on a project called the Terrestrial Diversity of Victoria Land has been researching mosses and lichens since well before the LGP framework was set up. His team includes collaborators from Germany, Austria, Spain and Australia, and he's also actively collaborating on research on the Antarctic Peninsula. His team has found that lichen species numbers are high in the maritime Antarctic, but relatively constant and low on the continent. They've also found no apparent decline in the number of species found along the Victoria Land coast as latitude increases. They've actually found a large number of moss and lichen species quite far south along the coast, whereas they've found fewer species at some more northerly sites. From this they've suggested that it's the microclimate in a given location that determines what kind of species exist and to what extent they can thrive. Dr. Mark Stevens, who is currently at the South Australian Museum, has found evidence showing that a large proportion of invertebrate animals living on the continent have survived there throughout multiple glacial cycles over millions or tens of millions of years in refugia. So in these cases the observed distributions may have nothing to do with the latitudinal gradient, but rather pockets of some species surviving under unusual conditions. Dr. Vonda Cummings and her team from New Zealand's National Institute of Water and Atmospheric Research have determined that observed characteristics of marine benthic communities along the Victoria Land coast are linked to differences in ice conditions between locations. Dr. Mary Sewell from the University of Auckland has observed no distinct interannual differences in the composition of the marine meroplankton (any organisms that spend part of their life as plankton, usually in the larval or egg stages) community at the sites she's studied along the Victoria Land coast over two seasons. She has, however, observed significant differences between sites. Does the presence or lack of seasonal ice cover in a given area of the Ross Sea play a major role in determining which species live there? Does snow and ice cover play a major role in the terrestrial areas? In the areas where the sea ice breaks out sooner rather than later it has an impact on incoming solar radiation, as well as on the phytoplankton bloom - as the sea ice deters UVB (short wave ultraviolet) radiation from penetrating the water. But in the terrestrial realm scientists are finding that the availability of moisture makes a big difference. Going back to Prof. Allan Green, he and his team have found that just a little bit of moisture from small melting snow patches activates any nearby lichens and mosses, meaning they start to photosynthesise. But if the wind has blown all the snow away and the area is dry, then the mosses and lichens are photosynthetically inactive and remain in a kind of "inert" state until they get some moisture and are re-activated. Are there plans to expand the latitudinal gradient project outside Victoria Land? Now that the LGP has proved to be a successful way of facilitating scientific collaboration and coordination, there have been several meetings and workshops between scientists studying the Victoria Land coast and the Antarctic Peninsula to discuss how the LGP can be used as a model for research on the Peninsula and other areas in Antarctica that encompass a spatial gradient. The next step is to see if a more formal Antarctic-wide LGP can be organised. As it is, there are already several collaborations happening between scientists working in Victoria Land and on the Peninsula, so it would just be a case of putting this research into a more formal framework. Shulamit Gordon is project manager for the New Zealand LGP - who also happens to be Secretary for the SCAR Evolution and Biodiversity in the Antarctic programme and Co-Deputy Chair of SCAR's Standing Committee on Antarctic Data Management.